Barlow lenses offer an easy, economical way to increase the magnification range of your eyepieces. A 2x Barlow lens doubles the magnifying power of your eyepiece by doubling its effective focal length. For example, an 18mm eyepiece used with a 2x Barlow lens would have the magnifying power of a 9mm eyepiece. It’s like having two eyepieces in one! If you’re looking for an affordable way to achieve high-power viewing of the moon and planets, double stars and even close-up views of terrestrial subjects, a Barlow lens is the answer. Barlow lenses mount into either your telescope’s 1.25" focuser or visual back. 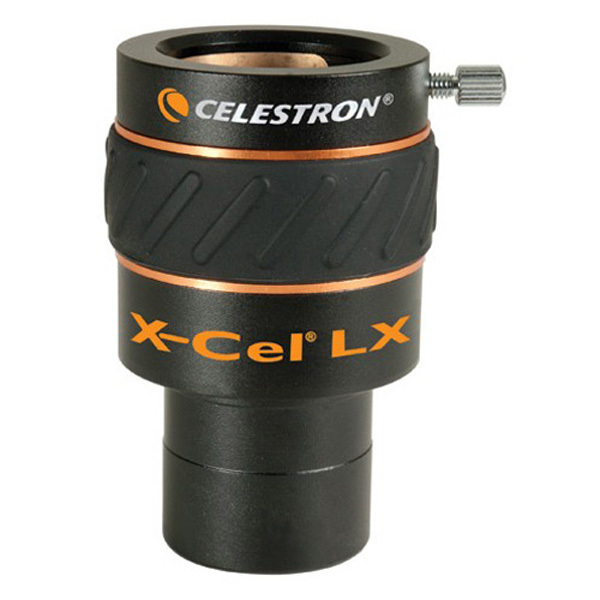 The NEW Celestron X-Cel Barlow is a high quality 2x Barlow lens that doubles the magnification of all 1.25" eyepieces. This Barlow has great features like, low profile, 3-element fully-multicoated optical design and blacked lens edges. 4.8 (Based on 4 Reviews) 100% of reviewers recommended this product. Review by Hill Country Guitar Player of Buchanan Dam, TX. I like this 2X SO much better than the stock 3X Barlow that came with my old 'scope. I don't regret this purchase one bit. Review by NoRules of Nissedal, Norway. It's large, heavy and bulky, and personally I don't like stuff with rubber on it. The optics are splendid. Best I have tried. Review by Chuck Hunt of Brook Park, Ohio. I was looking for a good 2x barlow with 3 elements. This Celestron barlow fit what I wanted very well and provided very good image quality. Review by Nakegun of Lake Elsinore, California. This is produced to replace the made-in-Japan Ultima series, and I have no issues with its capabilities for visual astronomy. Unlike the unit it replaces, this model utilizes a brass clamping ring to hold eyepieces, which van catch on the "safety" cutout some mfrs have in their design.